Our system is the first such product on the market. Its complexity will be appreciated on any watercraft equipped with navigation devices. Built-in advanced artificial intelligence algorithms will assist navigators in making decisions at sea. The competitive position of maritime transport compared to the other transport modes leads to a continuous increase in the carriage of goods by sea, which entails higher traffic intensity, vessel tonnages and speeds. This, in turn, adversely affects the safety of people, ships, cargo and marine environment. To enhance navigational safety, efficiency and competitiveness of transport services in maritime trade, both ships’ and land-based vessel traffic centres’ equipment and systems are constantly being upgraded. Such facilities perform mainly information functions and in this respect they support the process of safe ship conduct. However, the amount of information available on the ship has been on the rise while the technical systems have become more complex. For these reasons both information management and the resultant decision making are difficult, e.g. emergency situations may go beyond decision-maker’s abilities. marine environment protection and prevention of ecological disasters that occur as a consequence of collision of ships carrying dangerous goods. The navigational decision support system NAVDEC is the first navigational tool worldwide that performs information functions as well as those typical of decision support systems. Its innovative functionalities, significantly extending the performance of devices generally carried by ships, have now a status of patent applications filed at home and internationally. The NAVDEC complements the navigational equipment of the ship. It is a real time system handled by the navigator. The system observes its ship and the environment and records information on the present navigational situation. On this basis the system identifies and assesses the navigational situation (processing) and works out solutions (decisions) assuring safe navigation. For the system to function correctly it has to co-operate with standard equipment and systems installed on board (often used on leisure craft as well) such as: log, gyrocompas, ARPA (Automatic Radar Plotting Aids), GNSS (Global Navigational Satellite System), AIS (Automatic Identification System), ENC (Electronic Navigational Chart), sources of current navigational data. Similarly to the ECDIS system (Electronic Chart Display and Information System) the NAVDEC performs information functions – on one screen it presents bathymetric data from an electronic chart, an image of surface situation from a tracking radar, positional information from the AIS and GNSS receivers. Finally, it determines and presents to the navigator movement parameters of targets in vicinity. Effective solutions to collision situations are based on the data defining own and other ships’ (targets) movement parameters. The accuracy of data presented to navigators is of major importance for their correct situation assessment and decisions to be made. Therefore, the NAVDEC system performs the fusion of own ship data (measurements from a number of shipboard GNSS receivers are used) and integration of data on targets from alternative sources (tracking radar, AIS). Another novel function of the NAVDEC is an analysis and assessment of the navigational situation done in relation to all other or selected targets located within eight nautical miles (distance can be adjusted by the navigator). This is one of the decision making steps normally taken by the navigator, simply because the situation assessment takes into account relevant regulations. 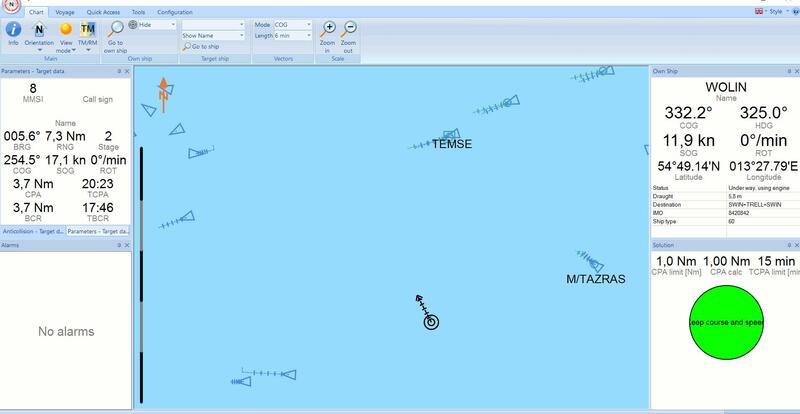 Thanks to the NAVDEC system the navigator is currently advised on the identification of an encounter situation in compliance with the Collision Regulations. This is a considerable aid, particularly in heavy traffic, although collisions of one-to-one ships in the open sea are known (m/v Gotland Carolina and m/v Conti Harmony in 2009). Where a situation is qualified as a collision situation, the navigator decides on a safe manoeuvre, the one that solves a given situation, determining what to do (alter course and/or speed) and the manoeuvre parameters: moment to begin it and values of course and/or speed alteration. The navigator may specify a safe course, on which the target will be passed at a preset range considered as safe. To date the NAVDEC is the only tool worldwide capable of performing this function. The NAVDEC ‘knows’ the Collision Regulations, principles of good sea practice, as well as criteria used by expert navigators. Apart from one specific solution the system submits, alternative solutions conforming with the regulations are also determined (possible range of course and/or speed alterations). Besides, the navigator is given a justification of the proposed manoeuvre. This function refers to all or selected targets. marine officer training centres offering courses in the Collision Regulations – a module of navigational simulators (e.g. ship-handling, ECDIS). The implementation of NAVDEC on ships will contribute to the reduction of marine environment pollution. Each ship’s collision is a potential environmental threat. According to the Baltic Marine Environment Protection Commission (HELCOM) in the years 2000 – 2009 there were 1006 accidents on the Baltic Sea alone. The majority of accidents occurred due to human errors, including incorrect situation assessment and wrong actions resulting from improper interpretation of radar data. 40 of those accidents caused environment pollution. The major task of navigation is to conduct a ship efficiently and safely along an assumed trajectory. Bearing this in mind the navigator has to carry out two basic tasks: ship conduct along a preset trajectory and collision avoidance. Effective solutions to collision situations depend on ship movement data (own and others) and constraints resulting from the shape of the area. The accuracy of data presented to the navigator is of importance for the correct situation assessment and his/her decisions. Navigational systems presently used in the global fleet perform mainly information functions and correspondingly, to some extent provide an aid in safe vessel conduct. However, none of the known systems displays to the navigator ready solutions to a collision situation that are worked out in relation to all vessles in vicinity of their ship. This considerably limits decision support, consequently it limits the effectiveness of collision avoidance. Nowadays the navigational bridge of a ship features a number of devices that are supposed to assist the navigator to sail safely. The ARPA (Automatic Radar Plotting Aid), a commonly used tracking radar is a marine tool for decision support in collision situations. However, due to its numerous limitations, the ARPA is sometimes ineffective. calculates new courses and speeds of own ship, such that other vessels will be passed at a preset CPA. Another information system commonly used on sea-going ships is the ECDIS (Electronic Chart Display and Information System) often referred to as an electronic chart. Apart from displaying the positions and movement vectors of own ship and targets (vessels in vicinity), it also allows to, inter alia, obtain information on depths, aids to navigation and coastline. However, it is only an information system. The NAVDEC system moves a step forward. Besides providing the navigator with the same scope of information, necessary for safe navigation, as the ECDIS, the NAVDEC recommends ready solutions enabling the ship to safely pass vessels or stationary objects. Moreover, these solutions take into account ship’s manoeuvring ability and the present area restrictions, i.e. existing traffic separation schemes, shoreline and safe depths. The NAVDEC is, therefore, a very useful decision support system. justification of the recommended manoeuvre. The NAVDEC is the first system in the world to offer support in navigation-related decision making on the ship to such a wide extent. It goes in line with the concept of e-navigation that is being developed on the IMO forum. In 2006 a Correspondence Group on E-navigation was established at the IMO. E-navigation is defined as ‘the harmonized collection, integration, exchange, presentation and analysis of marine information onboard and ashore by electronic means to enhance berth to berth navigation and related services for safety and security at sea and protection of the marine environment’.